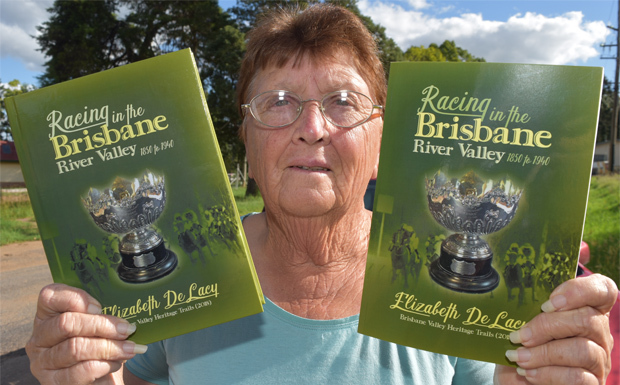 “Racing In The Brisbane River Valley” was researched and written by local historian Elizabeth DeLacy. It was officially launched last Thursday at a lunch at the Soldiers Memorial Hall in Moore. The book details the history of the many race clubs that exist – or used to exist – between Fernvale and Nanango. 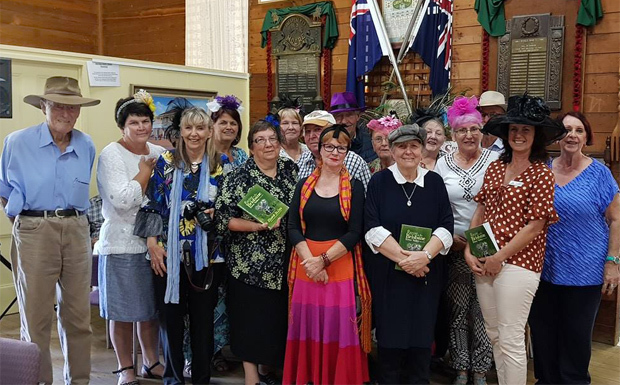 Brisbane Valley Heritage Trails (BVHT) members were invited to come along to the book launch wearing their finest Fashions of the Field hats, adding to the race-day atmosphere. 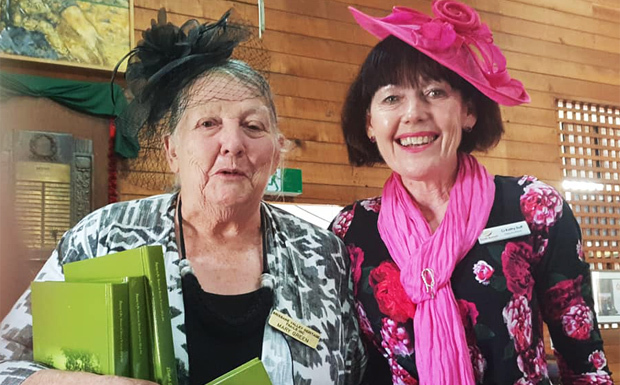 A special guest was South Burnett Deputy Mayor Kathy Duff, whose second cousins Patrick and Cedric Duff are in the book because of their long association with the local racing industry. (Kathy won the best hat competition!). Also present were former South Burnett councillor and long-serving Nanango Race Club committee member Barry Green, Nanango historian Mary Green, former Nanango mayor Reg McCallum, Somerset Mayor Graeme Lehmann and Somerset councillor Cheryl Gaedtke. 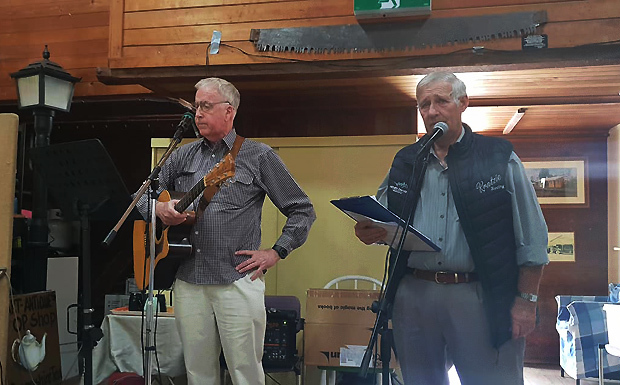 Local folk singer/guitarist Tony Foran, who has penned songs about the Brisbane Valley and Nanango areas, provided the live music. 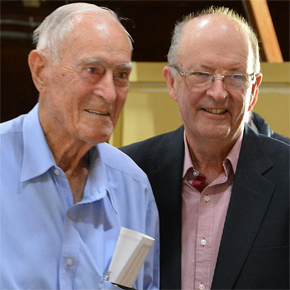 BVHT life member Elizabeth DeLacy has written several books about the history of the Brisbane Valley, including “Colinton Boys”, published in 2015, which details the stories behind the names on the Colinton War Memorial, and “The Life & Times of R.S. (Scamp) White” (published in 2014), about the former owner of Eskdale Station. 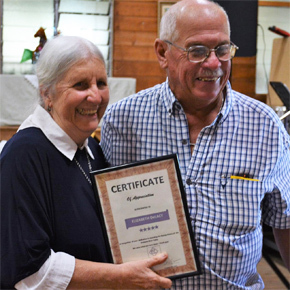 Nanango Race Club vice-president Bruce Webb presented Elizabeth with a “certificate of appreciation” from the club for her work in compiling the history. The book grew from information and photographs gathered by Elizabeth for the BVHT website and an earlier booklet. It even includes a photo of Reg McCallum riding a camel at Nanango Races! BVHT president Helene Johnson said the association received a grant to get the information published in book form. Twenty hard cover copies were printed as well as 50 copies in soft cover. A hard cover copy has been presented to the Queensland Library and will also be placed in the Nanango Library. The soft cover books are available for purchase for $30 from Heritage House in Yarraman.